Peter Charles Archibald Ewart Jennings, CM (July 29, 1938 - August 7, 2005) was a Canadian-American journalist who served as the sole anchor of ABC World News Tonight from 1983 until his death from lung cancer in 2005. Despite dropping out of high school, he transformed himself into one of American television's most prominent journalists. Jennings started his career early, hosting a Canadian radio show at the age of nine. He began his professional career with CJOH-TV in Ottawa during its early years, anchoring the local newscasts and hosting a teen dance show, Saturday Date, on Saturdays. 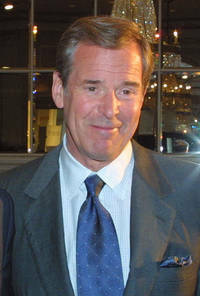 In 1965, ABC News tapped him to anchor its flagship evening news program. His inexperience was attacked by critics and others in television news, making for a difficult first stint in the anchor chair. Jennings became a foreign correspondent in 1968, reporting from the Middle East. This webpage uses material from the Wikipedia article "Peter_Jennings" and is licensed under the GNU Free Documentation License. Reality TV World is not responsible for any errors or omissions the Wikipedia article may contain.